It's with a soggy and failing heart that I present Backwater Gospel in its entirety for your viewing displeasure. It's a sad and sordid affair that will make you feel pretty rotten, assuming there's anything human left in that burned out husk that you call a body. Click on the hellish image below (courtesy of Esben Jacob Sloth ) to watch "Backwater Gospel" on Vimeo. Hell, you can even watch it in High-Def. And considering it's free, you won't find salvation at a lower price, friend. I was first approached by the director, Bo Mathorne, over a year ago. He wanted to know if I'd be interested in working on the score for an animated short film. At the time, he had some drawings and a strong sense of what he wanted to convey. While I'm normally hesitant in the extreme to get involved in a project like this (after scoring three other films that never saw the light of day), I was sold on the idea and committed wholeheartedly to the film. I submitted a lot of music that didn't make the cut (members of sonsofperdition.com can download one of these, Desert Wind, for free). There was a lot of back and forth between Bo and myself, but I feel like the results speak for themselves. I'll likely end up posting more of the songs that weren't used on sonsofperdition.com, so be sure to sign up if you're interested. It's free and you get access to a bunch of otherwise unreleased junk. When I was wrapping up the soundtrack for Backwater Gospel, Bo asked if I'd be interested in supplying the voice for the doomed sonofabitch that passed for the protagonist. This is wholly outside my comfort zone, so be kind. Anyways, I'm damn proud to have worked on this film, given how well it came together. Let me know what you think, and feel free to show it at your Sunday church service, hate group rally, random internet forum, hippie love-in, or wherever else you see fit. Also, now's a good time to start stalking Bo Mathorne. It's best to get in on the ground level with these things. Hello again, bitter friends and dear enemies. I was gloomily minding my business the other day, when I unexpectedly received a surprise email. In retrospect, if I had been expecting it, it wouldn't have been much of a surprise. Regardless, it contained a video created by some folks in Denton, Texas and helmed by Mary Fetters. 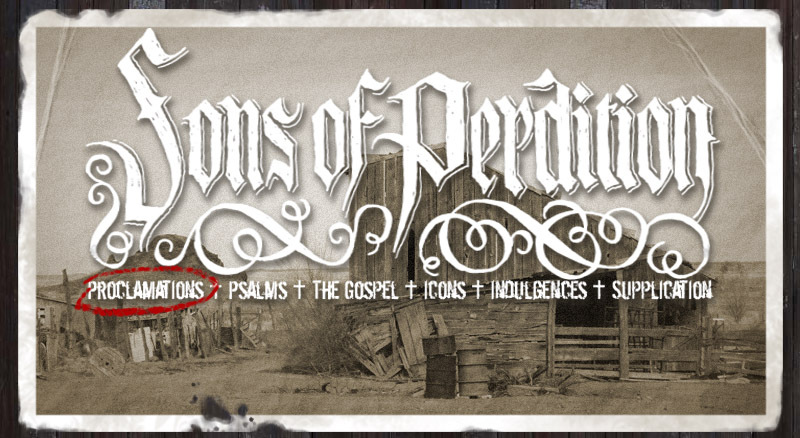 For those of you not in the know, Denton is where Sons of Perdition coalesced (as much as a one-man band is capable of coalescing, anyways). The video is for "Psalm 138" from the newest album, " Psalms for the Spiritually Dead ". I made this song with a ton of help from my old pal Dan 138, of the London-based band Onethirtyeight . That's Dan singing backup, providing weirdo atmosphere, playing piano, etc. He's absolutely integral to the song. If you haven't listened to Onethirtyeight before, I beseech you to do so at once. There's a reason I asked him to work on a song with me; a reason that should be made crystalline in your mind after listening to his work. Anyways, back to the video. You should watch it. Also, keep an eye out for more good stuff from RiskCard Productions. They're sure to be scheming up something new as I write this. 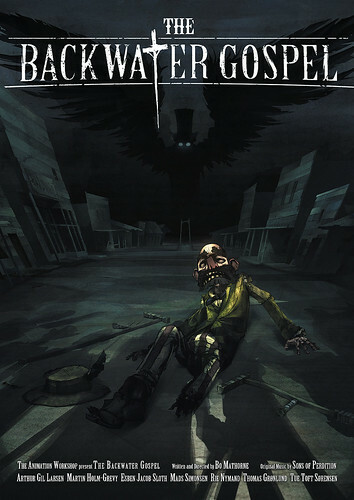 As I've mentioned on here from time to time, I somewhat recently recorded the soundtrack for a short animated film called " Backwater Gospel ". It turned out damn good. I'll share it with you soon. In the meantime, I'm giving away a song that wasn't included on the soundtrack because it just didn't quite work. It was too melodical, and didn't have a sickly enough atmosphere. Tentatively called "Desert Wind", for lack of a better name, I'm sure it'll turn up again. Odds are, it'll rear its head on my fourth album. "Psalm of Withering" Music Video! Over the course of the last few months, my good pal Bo Mathorne has been working on a music video for " Psalm of Withering ", off my album " Psalms for the Spiritually Dead ". I think you'll be pleased or horrified with the results. I know I was. Bo and I first worked together on his short film "Backwater Gospel". I recorded the soundtrack for it and even did some voice acting. Glory be. So without further ado, here's "Psalm of Withering". I'll let you know when "Backwater Gospel" is released, posting it on www.sonsofperdition.com and YouTube and all the other dives where you folks seem to congregate. It looks like it'll be around the beginning of next month. I'm also beginning work on my next album. I don't want to give away any details just yet, especially considering how long it takes me to finish the damn things. Expect it to be dark and weird.